The following is an excerpt of Part 2 in this two-part series. In Part 1, author Eric Singer covered Veni (I went to the site) and Vidi (I observed for general conformance with design intent). Sometimes observable deficiencies get missed, or the timing, relative solvency or insured status of the parties and plain old bad luck conspire to force you to defend your compliance with the standard of care. In tort claims (injuries, property damage or other calamities), most states have procedural mechanisms to apportion fault among the parties or to add parties potentially at fault. 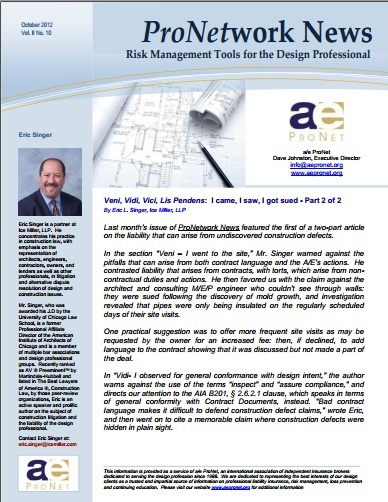 Contract lawsuits are different and an owner could choose to pursue the A/E and leave the contractor alone or to settle and join forces with the contractor. In contract cases, many jurisdictions make it difficult for an architect to pursue claims against a contractor without a direct contract. You can defend by blaming the contractor’s “empty chair” or try a more aggressive approach. The general conditions may provide you with some ammunition. General Conditions frequently contain a warranty in favor of both the owner and the architect. The AIA A201 (2007), for example, provides “The Contractor warrants to the Owner and Architect that materials and equipment furnished under the Contract will be of good quality and new unless the Contract Documents require or permit otherwise. The Contractor further warrants that the Work will conform to the requirements of the Contract Documents and will be free from defects, except for those inherent in the quality of the Work the Contract Documents require or permit.” (A201 – 2007, §3.5). Interpretation of this provision and rights of the architect in these circumstances varies greatly state to state. If viable in your state, a warranty claim against the contractor may prevent the owner and contractor from settling cheap or joining forces against the design team. To read about Vici, I conquered, visit our website where you may download the full PDF version of this October 2012 issue (and all previous issues) of our ProNetwork Newsletters. 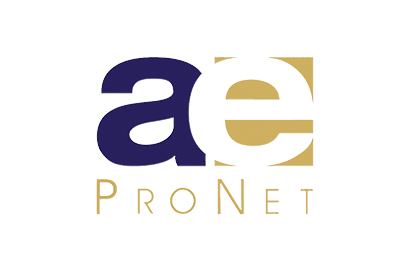 Don’t forget to contact your local a/e ProNet broker if you have any questions!